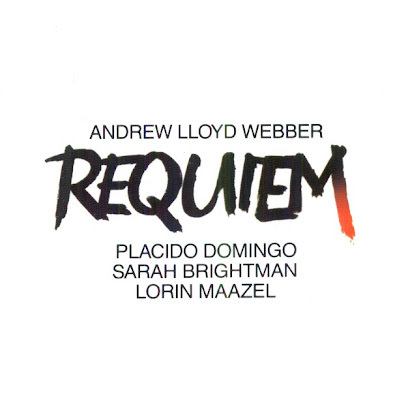 Andrew Lloyed Webber, the composer of the world famous musicals Cats, Evita, Starlight Express, wrote a Requiem for tenor, soprano and treble, choir and orchestra. Two events set the Requiem in motion. The first was the death of Andrew Lloyd Webber's father in 1982 and the second was a story about Cambodia in an obscure corner of the New York Times, concerning a boy who was faced with the choice of killing his mutilated sister or being killed himself. Cambodia has no musical influence on the score, but it did give Andrew Lloyd Webber the idea of scoring the Requiem for a boy, a girl and a man: in other words, treble, high soprano aqnd tenor. The writing is strictly along cathedral lines, but Lloyed Webber admits that it might not always be academically correct - "My father insisted that I should not be over-trained musically." Lloyed Webber Snr. was an organist at All Saint and at the Central Hall, Westminster, as well as being a composer of sacred music. The first draft of the Requiem was heard during the 1984 Sydmonton Festival. After that he "polished" the work. The polishing took a further half-year, probably the most concentrated and lengthy period of work Lloyed Webber has given to any of his compositions to date. Nothing has been allowed to distract from the Requiem. Thank you, Andrew Lloyd Webber, for composing this masterpiece. The "Pie Jesu" will always be in my heart ! The Compact Disc was released by EMI, 1985, (DDD). CDC 7471462.